Is The Air Force Plan To Retire The MQ-1 Predator Drone By 2018 A Smart One? It is one of the most recognizable and controversial machines of the new millennium. The RQ-1, and its armed cousin, the MQ-1, have redefined how America fights its enemies abroad. Now the U.S. Air Force wants to chuck them out into the desert once and for all, relying solely on the larger turboprop-powered MQ-9 Reaper instead. There is, however, little doubt that the Reaper is better at the Predator’s job in almost every way. First off, the Reaper entered service in 2007, just over decade after the Predator. It is more than twice as fast, carries 10 times the payload, is much more adaptable, and flies at twice the altitude. Its increased speed alone means that it can make it to its station and return home from that station, otherwise known as an orbit, faster. 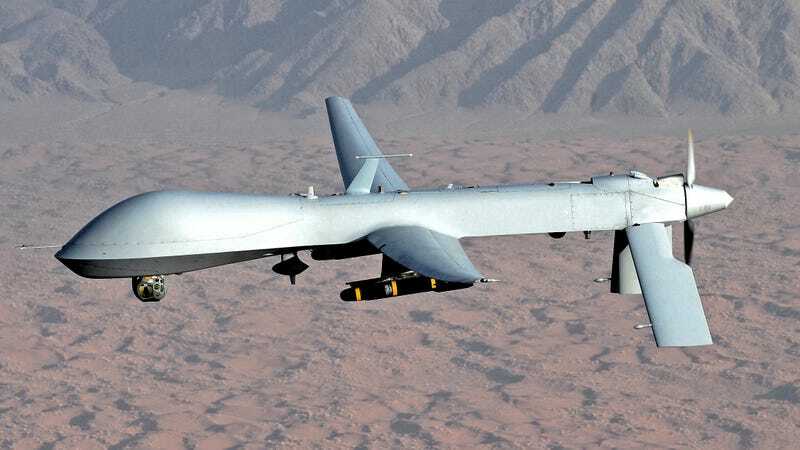 Its ability to pack many different pods — including exotic payloads like Wide Area Aerial Surveillance systems, 500 pound guided bombs, AGM-114 Hellfire missiles and other optional munitions — offers mission planners much greater flexibility compared to the diminutive MQ-1 Predator. But the MQ-9’s enhanced capabilities do not mean that the Predator is obsolete. Quite the contrary. For missions where the aircraft can be launched close to its intended orbit, and where the MQ-9’s weapons payload is not required, the MQ-1 remains a highly economical tool with an incredibly small logistical footprint. Part of the reasoning behind the Pentagon’s initiative to move the Predator from the front lines on the War on Terror to the boneyard is that the tempo of operations, or the the demand on the drone fleet, is decreasing... supposedly. Flightglobal.com reports that Secretary of Defense Ashton Carter has authorized a reduction in continuous unmanned “orbits” (this includes about 12 pilots and sensor operators, a command module, communications systems, three to four aircraft, and a forward deployed launch and recovery element) from 65 to 60. This decision was also made as the remotely piloted vehicle community within the Air Force has been suffering from low readiness and manpower, operating on just around 70 percent of its required manning levels, with many pilots and sensor operators electing to leave the service instead of continuing with the mission. Replacing the MQ-1 with the MQ-9 and drawing down the force a bit sounds great, but the question is, does this decision match the realities of America’s commitments abroad and the threats that persist today, namely the rise of the Islamic State across the Middle East? Considering that we have no official “boots on the ground” access in Iraq, Syria, Yemen and Libya, not to mention other key terror hotbeds in Africa, the Air Force’s unmanned aircraft contingent is possibly our best chance at finding, fixing and destroying the enemy wherever they operate. When you think of it, 65 orbits, although impressive technologically, does not cover that many areas or individuals of interest. As such, are the reduction in these orbits, using systems we have already invested in and own outright, really a good military decision? I would argue against it. Drone operations may not be cheap, but they are far less expensive than the alternatives and we should be growing the remotely piloted force not downsizing it. More than anything else this highlights an inability to properly address a systemic issue within the Air Force. If unmanned aircraft pilots and sensor operators are leaving the force due to being overworked, unsatisfied with their job or not feeling that they are respected, then the service must totally change how it recruits, assigns, utilizes and pays these people so that it don’t lose them. The Air Force has to think outside of its rigid pay structure and “white scarf” fighter pilot mentality to keep these personnel feeling valued and well compensated. Like so much when it comes to the “Boys In Blue,” the increasingly irrelevant fighter pilot mentality is actually causing harm to America’s ability to fight the enemy and create a well rounded future force. Above all else, the poor state of affairs that the remotely piloted vehicle community, which can be so different operationally than the traditional pilot corps, is a symptom of just how incapable the Air Force leadership is of adapting to this new technology, one that will become ever more essential as time goes on. It needs to change, and change fast. The good news about the Air Force plan to retire the MQ-1 is that some of the components used by the MQ-1 fleet have commonality with the MQ-9 fleet. Mainly these include some of the system’s communications elements and command and control trailers. Still, throngs of perfectly flyable MQ-1s would be sent to the boneyard, and according to the Air Force, they will be kept in non-recoverable storage and will not be sold to another air arm. It really is not hard to think of many other uses for the Air Force orphaned MQ-1s, of which there are about 145 in service today. If funded appropriately, the Border Patrol could clearly use them, along with other federal agencies, including the Coast Guard. During major natural disasters, MQ-1s could be launched to locate survivors and map destruction. Even the Air Force themselves could use re-purpose the aircraft’s simple airframe for a myriad of missions. Converting the MQ-1 force into simple autonomous drones, without a man in the loop or real-time information exchange, would be beneficial for lower-priority tasking, such as gathering imagery along a predetermined route. In a similar configuration, they could be used to stimulate, pinpoint and confuse the enemy’s air defense networks during the opening days of a conflict, especially considering how expendable they would already be. Even packing them full of as much fuel as possible and using them as simple beyond-line-of-sight radio radio relay platforms would be advantageous, especially for special operations missions (see Operation Red Wings). The Navy or Marine Corps could re purpose the MQ-1s to operate from supercarriers and amphibious assault flattops, which would offer a persistent information surveillance and reconnaissance platform with long endurance at low cost. This would be especially helpful for spotting shoreline targets, providing over-watch for Marine and special forces operations, or for sea control duties, investigating the ship around the Carrier Strike Group. The MQ-1s could even provide rudimentary beyond-line-of-sight network relay duties as a reserve force should out satellite systems be attacked. If anything else, our allies in the fight against terrorism and Islamic Extremism could make great use of the MQ-1s. Iraq in particular could have used their capability to spot and stop the ISIS blitzkrieg-like infiltration across that country’s sparse western deserts. Jordan, a close ally and security partner in the region, has been more than willing to fight ISIS over the long term. As such, providing them with a persistent reconnaissance and light attack capability that the MQ-1 brings to the table makes great sense and can offset their limited fighter aircraft fleets and precision aerial targeting capabilities. Even some of our allies in the Asian Pacific sphere could use the MQ-1s for various missions. Regardless who would receive the aircraft under such a plan, by bailing the MQ-1 fleet to our allies in the region, the U.S. can continue to benefit from the aircraft’s capabilities while not having to pay for their operations. In the end, maybe the Pentagon’s decision to send the MQ-1s to rot in the desert is something of a canary in a coal mine. It serves as yet another symbol of poor decision-making at the Defense Department when it comes to creatively using and re-purposing assets it already owns and providing the assets it needs to win the wars it is currently in. Even worse, it is also a red flag as to just how poorly the Air Force’s prevailing culture and leadership is adapting to unmanned aircraft operations. All this has to change if America is to retain the most advanced, flexible and capable military on the planet as bad decisions now turn into strategic weaknesses later, and our nation’s enemies are working harder than ever to exploit these weaknesses.